The most common fear I see clients for is fear of flying. Otherwise known as aviophobia. There are different reasons, as with any phobia, that seem to be the root cause of this which can include a previous claustrophobic incident, lack of control, lack of trust and a vicarious phobia – ‘caught’ from someone else. 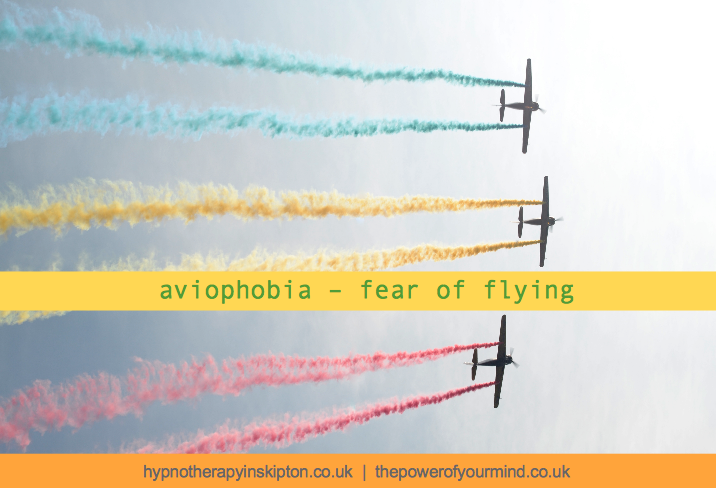 Many seem to say to justify this fear , saying that it makes sense to have this phobia…” Of course there is a chance that the plane may crash so therefore it is sort of rational”. Which will make sense to some. However, I have never had someone, as yet at least, who also has a fear of car travel, which statistically is more dangerous. Also, based on the rational argument we should have a fear of beds (where death is most common) and bathrooms ( where accidents are most common). I enable my clients to feel free from their phobias. As I do with all issues or goals that I see I aim to best understand what is going on now, what has happened in the past and what they want for their future. This is so the hypnotherapy can be the best tailored solution for them.